I am really sorry that it has been so long between posts. 2012 is shaping up to be a huge year, and so far I have had very little time to come up for air. There are lots of big projects (both professional and personal) on the horizon, and I can't wait to share them all with you! While I can't promise weekly posts, I will certainly try to get artwork up more regularly. This little piece is something that I will have with me at Wondercon this weekend! I had such a great time working on this tribute piece that I thought it would be fun to do another in the same vein to celebrate Wondercon's temporary move to Anaheim. If anyone is coming to the show, you can find me at Small Press table 108. I'm really looking forward to a fun weekend, so please stop and say hello! Hi, Brittney! I really admire your work. I think it uses too many colors and awesome assembly does. Congratulations! I wish you much peace and success. Big hug. Beautiful piece! I love mood and atmosphere! Glad you're back! Oh how wonderful! I'm going to Wondercon this year (never been before) and I can't wait to see your work in person! I was recently shown your book Confetti and I just fell in love! We are miss you!! Have a nice weekend!! YAY! A fresh posting from the lady herself! Really wish we could attend Wondercon and finally meet you but alas, Ohio is so far away. I've asked my husband to forego Sees chocolates this Easter and just get me another 'Brittney Lee' piece. And for me to give up sees. that's sayin' something! Please keep posting - love to see your work! Any word on the availability of a Mermaid Lagoon print?? how exciting, I'm looking forward to see you and your new work at Wondercon! man..I really wish I'd gotten down to Wondercon, always love seeing your latest stuff, Brittney! And like to hear your keeping busy. Hope to catch up the next time I catch you at a expo or when I'm visiting friends up at Disney! Hi There!! :D I've just found your blog. I really like your work. It's pretty nice how you use the paper to create depth. I especially like the use of colors, creates a special atmosphere and works depth and illumination very well. Can I ask a question? Since I'm pretty new at seeing this type of art. What is it called? 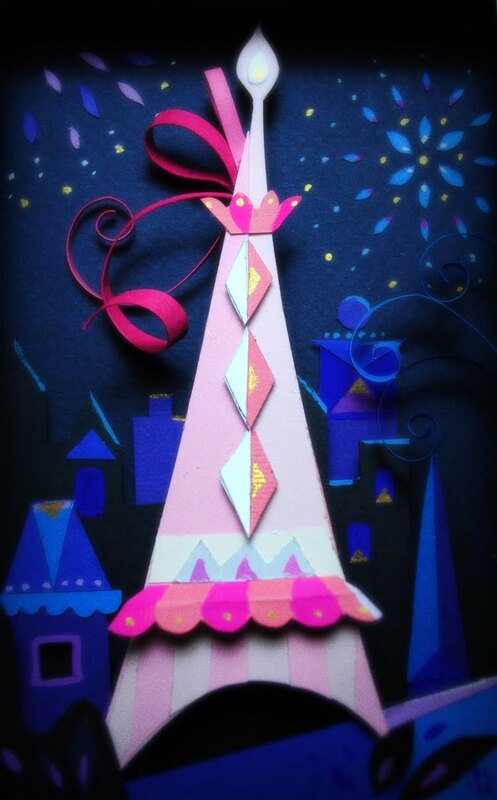 I mean I know it's paper art, but if there a specific name for the type of paper art you make? I'm sorry if this question is too basic. This is pretty new to me. I'm so glad I came across your work at Wondercon. I had a print framed at a local shop and they were raving about your work and wanted to know who the artist was. Any plans on attending Comic-Con in San Diego? This is pretty - glad to hear that the world is keeping you busy with exciting projects! People from Paris thank you for this beautifull eiffel tower! This is fantastic and amazing. I'm so impressed with the cool designs.. I appreciate your wonderful outputs. I just found your work on the internet and I must say: Awesome! Wonderful work you done really impressed. had the strong feeling that a single position in this matter. Section that you recommend Nadi, I was looking at. We liked this post thanks a ton! HI, Your work is amazing and so inspiring. I wish you much peace and success.